In homage to ‘Singing the City: The New York of Dreams’, the first map in Nonstop Metropolis: A New York City Atlas by Rebecca Solnit and Joshua Jelly-Schapiro, we are celebrating the official publication of the book with a playlist curated from iconic songs from New York City’s boroughs. The sheer range of songs celebrating New York, from Broadway musicals to hip-hop and every possible kind of ballad and rant in between, makes choosing which to feature nearly impossible. * So, we’re making it into a journey. Get a peek at the ‘Singing the City’ map and others in today’s feature on Brainpickings. Just like so many people have been inspired by one of Nonstop Metropolis‘ maps to envision the city’s subway map with stations named for famous women, imagine where your favorite New York song might fall on the map. 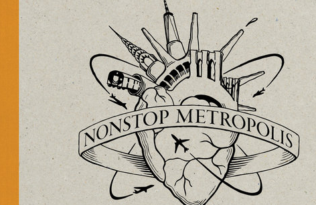 Stay tuned for our second Nonstop Metropolis playlist, featuring songs from Brooklyn & Queens. In a special event co-presented by Harper’s Magazine and BookCulture, Rebecca and Josh will be doing a reading and signing on Thursday evening. They will be joined in discussion by Paul La Farge. *We also had to remaster our playlist of dreams based on what was available on Spotify. Some of those missing tracks might appear in future posts, but meanwhile feel free to tell us on Twitter what you’d add to the mix: @nonstopatlas.